Albany- Ernest J. 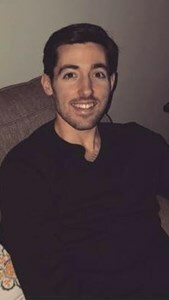 "Ernie" DuPont, 26, passed away peacefully on Wednesday, September 5, 2018 after a nine-year courageous battle with Degos Disease surrounded by his loving family. Born in Albany on January 15, 1992, the son of Ernest E. and Susan (Navarro) DuPont. Ernie was a 2010 graduate of Colonie Central High School, where he played soccer and basketball; he was a great teammate and athlete. He went on to receive his Associate's degree from Hudson Valley CC and his Bachelor's in Biology from Sage College of Albany in 2016. Ernie was an avid football fan, especially of the NY Giants. He had an amazing sense of humor, loved to make people laugh and enjoyed spending time with his family. Ernie had a strong Christian faith, which was everything to him, and he was a member of Our Savior's Lutheran Church, where he attended nursery school through fifth grade. Ernie worked for The Center for Rheumatology and had just been accepted to Nursing School at Sage College of Albany. Ernie is survived by his beloved fiancée, Keeley Gaffney and his loving family, parents, Ernest & Susan DuPont; sisters, Kerri Sawyer (Jeremy) and Jennifer Morin (Matthew); paternal grandparents, Ernest & Sharon DuPont; maternal grandfather, Joseph Navarro. Ernie is also survived by his nephew & niece (and Goddaughter); Zachary & Megan Sawyer and his second family, The Gaffney's; as well as many aunts, uncles & cousins. Ernie’s family and fiancée would like to thank Dr. Lee Shapiro for taking on Ernie’s case nine years ago when he had no knowledge of this ultra rare disease. Dr. Shapiro’s dedication and perseverance led him to find medications that gave Ernie nine more years with those he loved. During those nine years, Ernie was on a path that he did not choose, but he met it with determination and a warrior’s spirit. They would also like to thank the caring people of The Center for Rheumatology, NY Presbyterian CTICU and Albany Medical Center MICU. One of the blessings that came from Ernie’s battle over the past 6 months was the formation of the “Ernie’s Prayer Warriors” Facebook page. Over 1200 people joined Ernie in his battle through prayer and encouragement. Ernie read the page daily when he was able and drew inspiration throughout the last 6 months of his fight. The page also became a source of great encouragement and blessing to Keeley and Ernie’s family. Ernie’s family would like to express their gratitude to all those who invested in Ernie’s life. Calling hours will be held on Tuesday, September 11, 2018 from 3pm until 7pm at Our Savior's Lutheran Church, 63 Mountain View Ave. Albany, 12205, where a service will be held on Wednesday, September 12, 2018 at 11am. Burial will follow at Memory Garden's, Albany. Add your memories to the guest book of Ernest DuPont. My name is Puri. I from Spain, I’m Adrian’s mum. My son passed away two years ago, he was ill with Degos disease. It’s difficult for me to put my feellings into words but I want to say that me and my family are so sorry for the loss of Ernie. Ernie was our inspiration when Adrian was ill, also we think of him all this time when we remember Degos disease every day. Ernie and Adrian were brave to the end with this hard disease. I think Ernie and Adrian are together in this moment taking care of us. Ernie was such a gentleman and always a pleasure to work with. I never heard him say any unkind words about anything or anyone. The smile on Ernies face, which was always, would light up a room. What a pleasure and, how lucky we were to know him and what a loss to all. I know how he loved his family, Keeley, the Gaffneys and his dog, Shelby. What a loss to all of us but how lucky the heavens are to have this incredible young man. I know you will spread your wings in heaven Ernie DuPont, fly high and be at peace, for we will miss you. Will never forget working with you, Ernie. It was wonderful to have known you. To all of Ernie’s family: my heart, thoughts and prayers go out to all of you. It was a pleasure to have known your son, and your fiancée, Keeley. God has gained an angel. He will forever be your guardians. Although Ernie's life was short, he had a tremendous designation. I pray for all of those who knew and loved him as he impacted and changed hearts. May his memory continue to ignite love, compassion and sympathy for others. Bless his soul as he arrives at a place God has waiting especially for him.